Season ground beef with salt and pepper. Cook in skillet over medium high heat until well browned. Stir in taco seasoning and water. Bring to a boil, then reduce heat to medium-low. Simmer until most of the liquid evaporates. 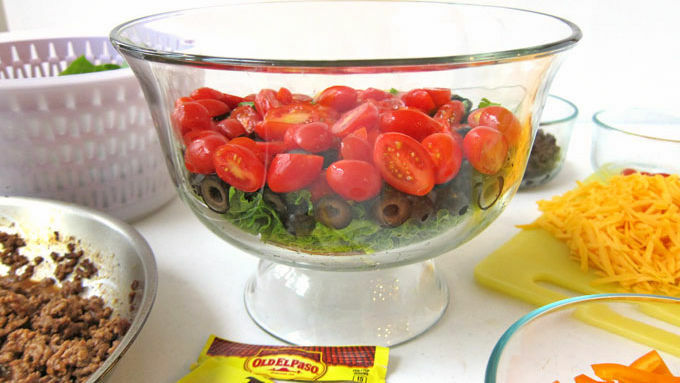 In a large trifle bowl, use two thirds of the torn lettuce to create your base layer. Follow with sliced black olives and two thirds of the halved tomatoes. Top with remaining lettuce. Next, layer on the chopped peppers, followed by the black beans and shredded cheese. 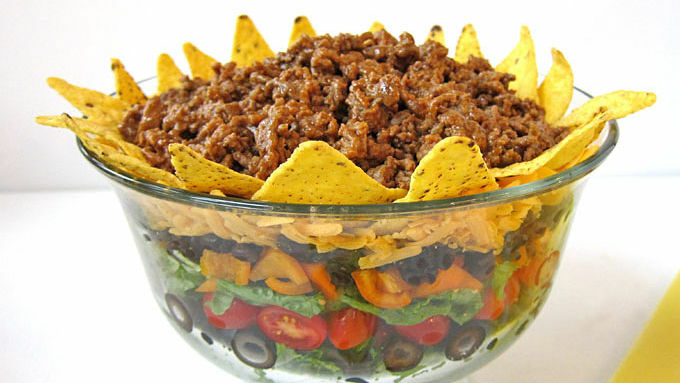 Arrange tortilla chips around the top edge of the bowl. Break remaining chips into small pieces and sprinkle over the salad. Top with hot taco meat. Garnish with sour cream, plus additional cheese and tomatoes as desired. For everyone who’s ever wanted to just eat dip for dinner. 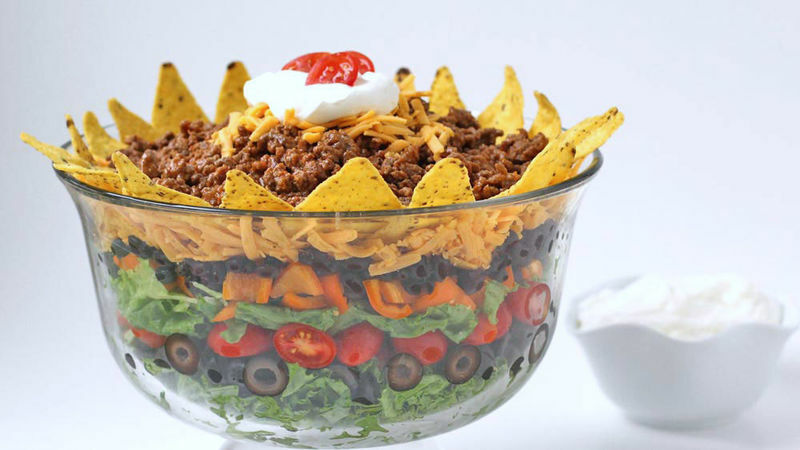 Add some flair to your dinner tonight by making this Mexican Layer Salad. The layers of brightly colored vegetables, cheese, beans and meat, turn this ordinary meal into a fiesta. So, let’s get the party started. Garnish your layered dip with a dollop of sour cream and some tomato slices, if you’d like, then serve with the remaining sour cream. Now sit back and enjoy your fiesta (for dinner).